Friday prayers for two Kashmiri students in the Central University of Haryana (CUH) and four Muslim daily wage labourers turned into a nightmare when they were attacked by a mob. 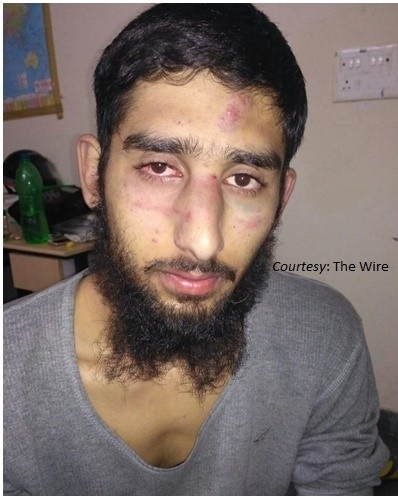 The first incident happened in Masani Chowk when at around 2.30 pm, Aftab Ahmad and Amjad Ali, who belong to Rajouri in Jammu and are now enrolled in the geography department of CUH, were on their way back from the nearest mosque in Mahendragarh town, around 11 kilometres away from the university, when a group of 10-15 motorbike-borne men abused and attacked them. According to Ahmad, the attack was unprovoked. “My friend and I had gone to the mosque to offer namaz yesterday. Just after we left the mosque and were heading towards our bike, we were assaulted by a mob. We asked them why were we being targeted but they didn’t say anything and just kept hitting us. We asked people for help but nobody intervened. It’s shameful how everyone just stood there and watched while the mob attacked us with bricks and helmets,” an India Today report quoted Ahmad as saying. After the prayer, when they made their way to a nearby tailor shop on Aftab’s motorbike, they saw a group of 10-15 men on their bikes following them. Within minutes, the group snatched their helmets and started hitting them. The men also had bricks with which they hit Ahmad and Ali. The crowd just stood and watched the incident.” “There were reports of some Muslim workers from Bengal and Bihar also facing similar attacks on Friday. While the attack on Kashmiri students was highlighted, I think the mob had planned to attack Muslims in general who were returning to their respective places of work after the jumma prayers. It appears to be a pre-planned attack as the group of attackers were waiting for people to come out from the mosque.” At least four workers were attacked on February 2 – two near Bahadur Kothi and two near Ram Vilas Kothi in Mahendragarh market. Mukul Sheikh, a brick kiln contractor confirmed that two of his workers were beaten with stones. “After they left the mosque, a group of five to seven people surrounded them and attacked them with stones. The attackers left after five minutes. My workers were so shocked that they came running to me. I got them some medicines. But they are now so scared to leave the factory premises. Since yesterday they have been crying, asking me how will they go out to buy items of their daily use,” Sheikh told The Wire.